During the months of October, November, and December 2014, Imua Family Services was the recipient of Ohana Fuels, “Fuel Up. Do Good” Program. A portion of proceeds from fuel sales at all Maui Locations supported Imua Family Services continued efforts. 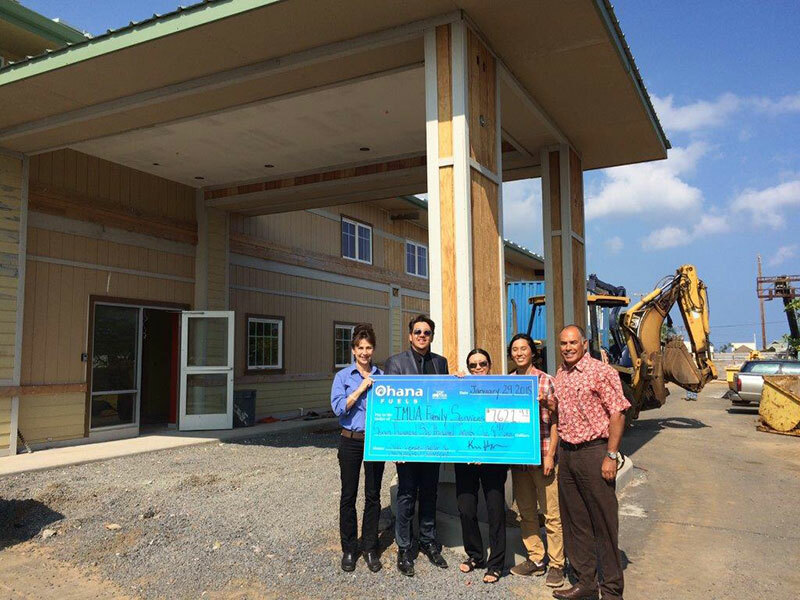 The total amount rose from all activities supported by Ohana Fuels, totaled over $7,500. Additionally, Imua Family Services’ Camp Imua Program hosted two car washes with proceeds to benefit a week long recreational camp for keiki with special needs. Proceeds from “Fuel Up. Do Good” will support Imua Family Services’ Early Childhood Development Program for children ages 3 to 6 can receive therapeutic developmental services to address mild to moderate delays and do not qualify for special education services from the Department Of Education. This vital program allows many children and families on Maui to continue to receive support after aging out of federally funded Early Intervention services. “At Ohana Fuels, our first priority is “family” and everyone who lives in the neighborhoods we serve. So we’re proud to support the organizations and missions important to you, and Imua Family Services is one of those organizations,” stated Kimo Haynes, President of Hawaii Petroleum. About Ohana Fuels Ohana Fuels, a TOP TIER™ brand of Hawaii Petroleum Inc. is on a mission. We pledge to provide ONGOING DONATIONS through our “Fuel Up. Do Good” community giving program to local groups and charities that impact the neighborhoods we serve. Ohana Fuels has eight SAFE, CLEAN, CONVENIENT locations across Maui and four on the Big Island. Ohana Fuels gasoline has been certified as TOP TIER™ to meet the premier standard of gasoline for optimum performance and fuel efficiency recognized by seven of the world’s top automakers, BMW, General Motors, Honda, Toyota, Volkswagen, Mercedes-Benz and Audi. TOP TIER™ additives help clean your engine; optimize fuel economy; eliminate hesitation, stalling, and rough idling; restore optimum performance; and reduce emissions. For more information visit OhanaFuels.com. About Imua Family Services Today, Imua Family Services provides comprehensive early childhood development services to children and their families with the support and resources needed to achieve their full potential in life. Each year, over 3000 community members on Maui and Lanai receive support from Imua Family Services through the Infant & Child Development Program, Early Childhood Development Program, Newborn Hearing Screening, and Camp Imua. If you would like more information about Imua Family Services, please visit their website at www.imuafamilyservices.org or call 808-244-7467.